If you are looking for a truly heavy duty steam iron, you have to pick a model that has a separate tank and steam generator. There are no two ways about it. You get a specialized unit made up of two different parts that are designed to provide heavy duty steaming and ironing results. You get the best of both worlds. You get more steam as well as a larger tank which ensures that you can iron for an extended period of time without having to refill. 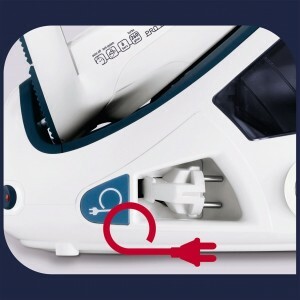 There are quite a number of two-piece steam iron units on the market and, for the most part, what separates them from each other is tank capacity. Of course, they also vary based on appearance. Considering how sleek and futuristic many of these models look, it is too tempting to think they are all pretty much the same. Wrong. There’s actually quite a big gulf of difference among two-piece systems. Some focus primarily tank capacity and mediocre steam generation. Others focus less on capacity and more on steam and heating power. The Tefal Gv8461 Pro Express Autoclean Steam Generator offers a great value because it offers great steam pressure, cleaning efficiency, speed, high heat, and optimal safety. All in one great-looking ultra-sleek form factor. Make no mistake about it, your primary focus when sizing up different steam irons is whether it delivers the goods as far as steaming is concerned. The good news about the Gv8461 Pro is that it definitely delivers the steam you’ve been looking for. If you’re concerned about steam pressure, this unit delivers a hefty 6 bar pressure worth of steam. That’s a huge amount of pressure and is usually all you’ll need to knock out even persistent creases and wrinkles. In terms of steam shots and volumes, this unit unleashes an impressive 260 grams/minute of steam boost or shot. As far as persistent or continuous steam output, this model delivers 120 grams of steam per minute. Compared to one-unit models, this steam generator puts them to shame. Then again, that would unfair to those other steam irons because they make do with a one-piece design unit. This Tefal model is a two-piece so you get really high heat, lots of steam, and lots of power. Of course, expect to pay for specialization. At 157.41 GBP, this unit is far from cheap. 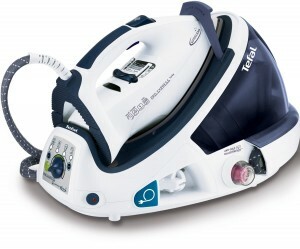 However, if you are serious about knocking out heavy wrinkles and creases or you deal mostly with very uncooperative or hard to work fabrics, this Tefal model delivers solid value. It has a high enough level of steam and heating power you can make quick work of even moderately heavy loads. Best of all, you can continue to work on many items for an extended period of time thanks to this model’s heavy capacity. One of the most common headaches consumers get with steam irons of different designs is the build up of small fibers on the soleplate. At first, your iron glides over the fabric you are working on. Ironing jobs are a breeze. You quickly tear through your loads thanks to your very clean soleplate. As time goes on and as you handle more and more loads, your ironing times creep up. Why? 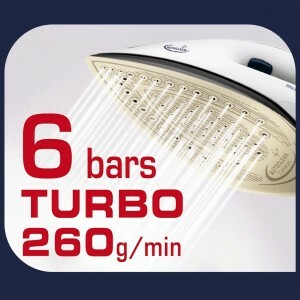 More and more small fibers get stuck on your iron’s soleplate. Fiber-heavy soleplates can be very hard to clean. In fact, many iron users only realize they have to clean up their soleplate when it is too late. There’s just too much stuff stuck on their soleplate and this has made ironing such a slow ordeal. The more fibers stuck on your soleplate, the more resistance and friction is created. This slows down ironing. In fact, you may have to make extra passes just to produce the smooth surface one pass used to create. You end up expending more effort. Thanks to fiber buildup, ironing becomes an unpleasant chore you’d rather avoid. 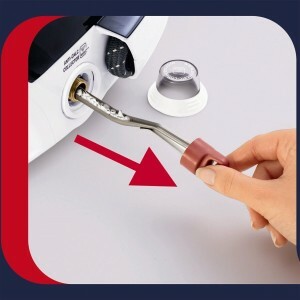 You can bid adieu to all this unnecessary hassle with the Tefal Gv8461’s autoclean soleplate. The soleplate of this model is specially designed so your normal usage will burn off fibers. It takes much longer for fibers to make a mess of your steam iron’s performance. Your soleplate remains clean for a much longer time and you don’t have to worry about drag and friction. Since steam generator models tend to cluster around the same level of steam and heat generation, what makes or breaks these models as far as overall value is concerned is the amount and value of extra features they bring to the table. As far as extras are concerned, the Tefal Gv8461 Pro Express feature great value-boosting functionalities. First, you get antiscale technology. Make no mistake about it, the accumulation of hard water deposits can dramatically shorten the product life of your steam iron. You may find yourself back on Amazon looking for a replacement steam iron much sooner than you anticipated if you pick a model that doesn’t have an antiscale feature. While not bulletproof, antiscale technology enables your steam iron to resist calcium buildup in its water channel for a longer time. You get more productive use from your iron for a much longer time. The second great extra feature this Tefal model delivers is its energy saving technology. You can save up to 20% on the electricity your steam iron normally consumes. Considering the fact that an increasing number of households are becoming more and more sustainability-conscious and green, this is definitely a welcome feature. 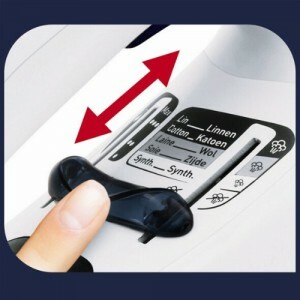 Finally, this model offers an auto-shutoff feature. Given the ever present threat of fires and other heat-related hazards, this model’s auto-shutoff system is definitely welcome and provides a much needed extra dose of peace of mind. When shopping for specialized two-piece steam generation systems, you have to be careful of glorified water tanks. These are two piece steam irons who only look interesting and useful because of the extra water storage they bring. The Tefal Gv8461 Pro Express Autoclean Steam Generator offers a full range of features and deliver a better overall value due to its steam and heating power, energy savings, safety, and anti-drag features among other extras I didn’t cover. Certain content that appears comes from Amazon services LLC. This content is provided 'as is' and is subject to change or removal at any time. This website is a participant in the Amazon Services LLC Associates Program, an affiliate advertising program designed to provide a means for sites to earn advertising fees by advertising and linking.